Last week was a busy week for our family. We dragged in from a wonderful spring break just in time to celebrate two birthdays. Number Eight turned nine on Friday and Number Six turned sixteen on Sunday. Yes, we do number the children since I seem to be unable to call them by the correct name. Numbers are not a problem. “Come her six, seven, I mean three!” Uh…No. Parents of herds don’t do that. We fumble through the names like a revolving Rolodex. “Did you hear what I said Mi, Hay, Mag, Le, Rei, Aus, Cor, Bam, YOU standing right in front of me smirking. YOU. I am talking to YOU!” Did you notice how easily I wrote Eight and Six up at the top of this paragraph? That is because I didn’t have to recall their names. None the less, we had a busy week finding the perfect presents, making two yummy cakes, printing out invitations for Number Eight and soothing Number Sixteen because her birthday came on a Sunday (the DMV is NOT open on Sunday!). Even though the week was stressful in a physical kind of way with all of my running around and getting things, taking folks from one place to another and making sure I had all the ingredients to make both a chocolate and a red velvet cake – plus lots of sugar for the icings – the week took an emotional toll as well. Number Six turned SIXTEEN! What a milestone. She ran to the car on Friday afternoon flustered. To take the driving test on Monday, she had to have an enrollment form signed by the principal. She had forgotten to get it earlier in the week and now, late on Friday afternoon, she did not have one. Bummer! She thought she might get one on Monday morning but wasn’t sure. I soothed, “Well, we can do it on Tuesday. One day won’t make that much difference.” I got “the look” from the teen. To be fair to her, she didn’t fret for long. We had too much to do! Friday cake and presents for Number Eight! Whoop! Saturday to the movies with other third grade boys. Sunday church and then home to whip out the red velvet cake. Sunday evening cake and small party for Number Six. Monday hit and I got a call in the middle of the day. We hurried after school but got there five minutes after the last time for testing new drivers. Disappointment loomed but I said, “We can do it on Tuesday.” And on Tuesday we did! I am proud to announce that Number Six is a newly minted driver of the road complete with photo ID that says mom does not have to be in the front seat! Whoop for both of us! Meanwhile, Number Eight comes home and reports that his buds had a great time at the movies and that he lost a tooth at school. What happened is that I fell asleep in my chair reading a book and forgot. He smiled and said, “I knew last year mom.” He grabbed the money and ran from the room to brag about the increase in his cash reserves. So, in one week my Number Six took a giant step towards adulthood and independence and my stint as the Tooth Fairy is over. I am sad but glad. How hard it is to be a parent some weeks. We want them to grow up and be independent and yet, it is awful to know that we will never sneak into a room again and slide money under the head of a sweaty little sleeper. 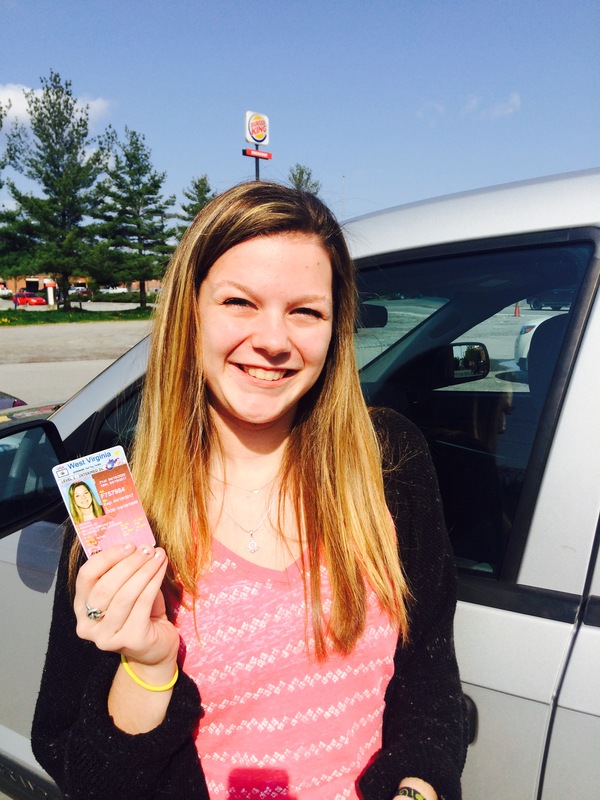 I no longer have to wait in the car for every practice or meeting because she can drive herself home. Alone. And so I say to Number Six and Number Eight. I love you beyond measure and am so happy that I was there for your last milestone. I wouldn’t have missed it for the world. This entry was posted in Posts, Stories / Articles and tagged Birthdays, Children, Drivers License, Family, Mother, parents, teenagers. Bookmark the permalink. Wow! Awarding winning writer! Eight (8) kids! 8! Bless you!